Stephen Zetterberg’s blonde hair falls to his shoulders, unrestrained by the headbands some of the other players wear to keep their vision clear. He’s locked into the game, scanning the field for pass opportunities or potential shots. The navy jersey on his back reads 12. Suddenly, one of the teammates makes a breakthrough, sprinting toward the goal at breakneck speed. He shoots. He scores. Zetterberg erupts into cheers from the stands. Although Zetterberg wears an official UCSD soccer jersey, the same ones worn by the school team, he does not play on the field. Instead, Zetterberg drives the team to victory as the 12th man, an honorary title in soccer culture that acknowledges the role fans play in making the team a success. “The idea of the 12th man, it’s not just me. It’s not that I’m the one person that is the 12th player of the team. The way the 12th man is supposed to refer to is it’s supposed to be the community. It’s supposed to be the fans. Everyone coming together as that 12th person,” the Eleanor Roosevelt College senior says. 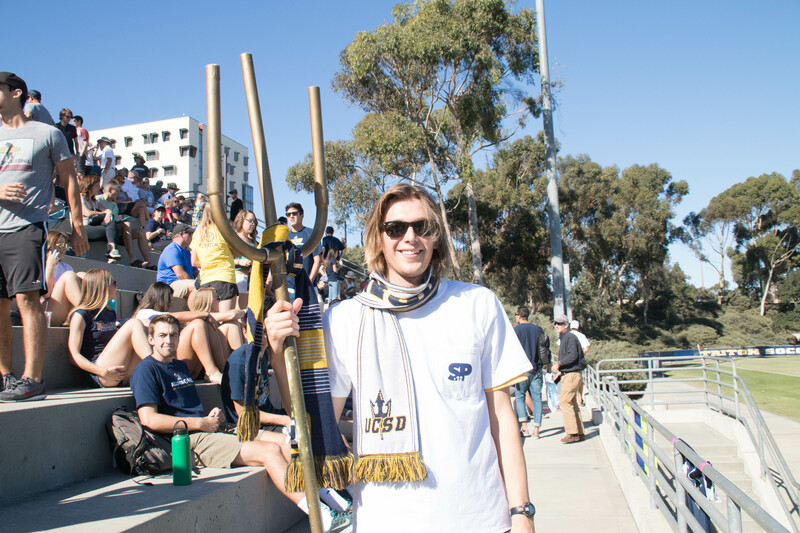 Sports fandom may not be what UCSD is traditionally known for, but this 12th man is slowly changing that with his passion for sport spectating. Zetterberg grew up with a close-knit family that watches sports fanatically. A casual soccer player himself, Zetterberg came to UCSD for its academics, but was thrilled to be housed with several members of the soccer team his freshman year in Africa Hall. He grew closer to the team members, not as athletes but as fellow fans, bonding together as they watched the Champion’s League tournament on campus. Zetterberg’s passion for watching soccer fit in well in Denmark, where he studied abroad last fall at the Danish Institute for Study Abroad in Copenhagen. He recalls touring Denmark’s stadium and staring up at a massive banner spread across its walls, “Best 12th Man” written in Danish. He could walk to sports bars from his university housing, spending game days at the official bar for his favorite team — Chelsea — surrounded by elated fans. Their energy was a stark contrast from UCSD’s games, in which the majority of spectators tended to sit for the entirety. It was in those bars that Zetterberg picked up the songs he has since taught his friends and fellow fans at UCSD. Inspired by Europe’s appreciation for soccer which extends beyond the players to the efforts and energy of the fans, Zetterberg took it upon himself to start new traditions for the Tritons. He returned to San Diego with a plan. Because Zetterberg is an RA for ERC, he was around campus over the summer along with school athletes and other early move-ins. He mentioned singing in Copenhagen to a friend on the team, who loved the idea. After recruiting his apartment mates for some extra spirit, they sat down and got to work. By adapting existing songs with a Triton twist, Zetterberg came up with a set of over a dozen songs, both for the team and for specific individuals, just in time for the first game of the season. His performance was a hit, and he and his friend group have since become an integral part of game day. Zetterberg walks the Guardian through an average game day. “We’ll wake up, usually there’s soccer on in the morning, and we’ll start singing as we’re getting ready for the game. We’ll start chants, kind of get into the vibe of it.” Navy and yellow shirts go on along with UCSD spirit scarves. They print out copies of the lyrics to their songs for fans to join in. They’ve even constructed a trident out of gold spray-painted PVC pipes. At yesterday’s men’s NCAA game against Western Washington University, Zetterberg led fans through “the Iceland clap” and “We Love You”, the team’s staple song. Spectators chuckled as they watched him jump and dance in the front row — no small feat for a lanky 6’4” young man. At one point, he even caught a ball sailing into the stands with a cheer and a fist pump. His commitment to the team has not gone unnoticed. When asked, head coach Jon Pascale had more than a few kind words to say about the team’s 12th man. Pascale goes on to recall several more games in which Zetterberg and his friends’ cheering has made an impact on the scoreboard. He points out that entire crowds now serenade the team with Zetterberg’s songs, and the team sings it right back at the end of a game to show their appreciation. In October, the team expressed their gratitude to Zetterberg in a video that has been viewed over 7,000 times on the official UCSD Men’s Soccer Facebook page. The players presented Zetterberg with the 12th Man Award and the #12 UCSD jersey which he proudly wears to their games. Zetterberg beams as we listen. “They’re great guys,” he says.